We thought surgery would last between 1 1/2 – 2 hours. It took over 4. The surgeon said that “the universe was against them today.” Some crazy, unavoidable glitches with the equipment occurred, his “very large and floppy” stomach wouldn’t cooperate when it needed to be inflated (at all), they needed for an extra surgeon to be called in to run the endoscope so that she could better handle the situation, another bizarre, unavoidable equipment glitch, and so on. In the end she said that everything was in perfectly and working well. His wake-up was challenging. He is used to getting quicker outpatient procedures in recent years and being able to go home right after. He was MAD when he realized that wasn’t happening. He was also in more pain and was very nauseous…..throwing up in recovery. He also made it extremely clear that he wanted what was on his stomach (his new G J Tube) off. So, we had to bust out my social story from the last post and explain to him what had happened and why that couldn’t be. He took this news FAR BETTER than we anticipated. Thank you Jesus! 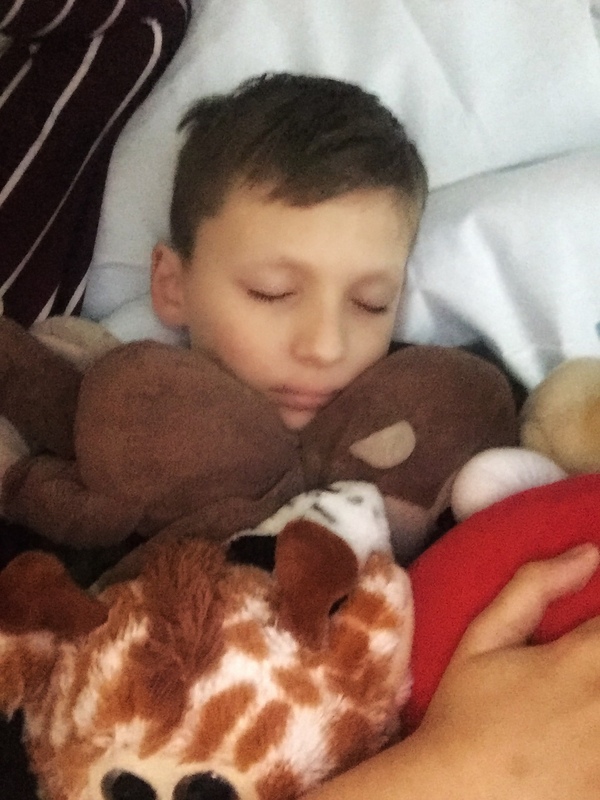 Once we found the right movie to distract him and some stronger pain meds…..we were able to move him upstairs and get him settled into the hospital for the night. During the night, the nausea really keyed up. He threw up 7 times and VERY forcefully. He didn’t have much in their to emit but he was throwing his body around and really challenging us to wrangle him. After a couple of smaller doses of anti-nausea medication…..we had to go to something much stronger which the surgeon had hoped to avoid. But he needed to settle. Morphine was also necessary due to intense pain. Finally around 3 a.m……he was able to rest a bit. Things were pretty uneventful (except for Cannon’s constant-ness of reminding us how much he wanted to go home). That is until about 11 a.m., when all of a sudden, he threw up A TON of blood. Pretty scary stuff! And his G Tube (to his stomach) which had been left open to drain began seeping this as well. It was a rusty color which means it was old. The surgeons weren’t overly concerned because they said it was a result of the surgery. If it was really red…..concern was warranted. But not this. At least at that time. But it still freaked us out a bit to see it all go down. We began feeding Pedialyte through his J Tube (into the small intestines) around noon. He was spacing out the Morphine well. And they decided to begin trying to feed elemental nutrition through his J Tube around 9 p.m. We were so hopeful. Late night…..I began to notice the seeping from his drain increasing. And soaking the bed. They wrapped the end of the connector tube in a diaper…..sometimes even 2 on top of each other…..but it kept saturating them. Did I mention that he was requiring more morphine today than yesterday? I wasn’t thrilled with that development. Mark and I had to leave the room for an hour each today to be taught how to insert a temporary tube if this one were to ever come out. The stoma will close quickly if exposed and we have to know how to place a Foley catheter to hold the pathway and get him to the hospital. We also received a visit from a rep for our home healthcare supply company. She gave us supplies that we will need and training on how to use them for when we go home. An IV pole, feeding pump (the very one I had been told I HAD to have…..Yahoo! ), tubing, feed bags, and a backpack….to name a few. I was starting to wonder if it might be possible for us to go home late this evening……and then the X-ray came back. 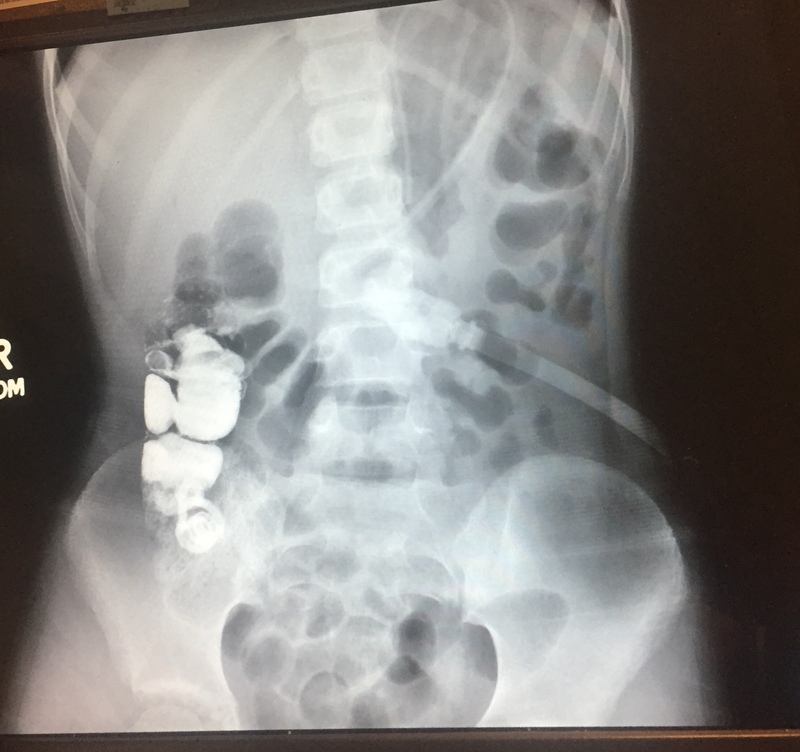 AND it showed that the J Tube has dislodged itself and is in the stomach now…..instead of the intestines. A huge disappointment and setback. To boot, there is no one who can re-place the tube until Monday. So, we have to stay the weekend and wait. And we need to feed him some nutrition…..so we are having to do so through the tube that is on the loose in his stomach. So, that’s the 411. I’m super tired so I will leave you with this. We are ok. He is handling this better than we could have hoped. He’s not happy, he’s whiny, and disappointed. But 6 years ago when we were a fixture in this hospital…..he required conscious sedation just to tolerate being inpatient. That is not happening right now nor does it seem like it will be necessary. Talk about a BLESSING!!! We have the absolute BEST doctors and NURSES (Oh my gosh…..I LOVE OUR NURSES) on the planet! We have to navigate some details…..Mark’s work schedule, my mom’s plane ticket, and getting some more supplies from home. But we will get it figured out. Cannon and Roxy are missing each other terribly so we have gotten a visit approved and are also fixing that tomorrow. Stay tuned for some super cute cuddle pics! I will leave you with a song that is one of Cannon’s absolute faves! We have been watching this video a few times a day since arriving to keep him as positive as possible. And to remind him that with God in his heart…..he has all he needs to be strong, courageous, and brave! WE LOVE YOU ALL!!!!!!! Thank you for following our journey!